Thus ends the first chapter of the book of war of Valmiki Ramayana which is the first book. Thus ends the second chapter of the book of war of Valmiki Ramayana which is the first book. Thus ends the third chapter of the book of war of Valmiki Ramayana which is the first book. 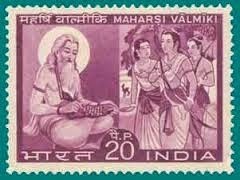 Then Rama the soul of dharma after being worshipped by Lakshmana and the king of monkeys went towards the southern side along with the army. Then Lakshmana who had meaningful presence of mind was being carried by Angadha went near Rama and told him the following very meaningful words. On the lovely mountain slopes, in full bloom on all sides were Ketaki and Sindhuvara trees, the charming Vasanti, Madhavi creepers with flowers full of scent, clumps of jasmine, Chiribila, Madhuka, Vanjula and Vakula, Ranjanka and Tilaka, Nyavriksha all in flower, Mango, Patalike, Kovidara in flower, Muchulinda, Arjuna, Simsapa and Kutaja, Hintala, Timisa, Chirna and Nipa, blue Ashoka, Sarala, Ankola and Padmaka all these trees were crawled in excitement by the monkeys who were delighted. Thus ends the fourth chapter of the book of war of Valmiki Ramayana which is the first book. Thus ends the fifth chapter of the book of war of Valmiki Ramayana which is the first book. 6.Ravana consults his ministers about impending invasion. Thus ends the sixth chapter of the book of war of Valmiki Ramayana which is the first book. Thus ends the seventh chapter of the book of war of Valmiki Ramayana which is the first book. 8. That Ministers boast about themselves. Thus ends the eighth chapter of the book of war of Valmiki Ramayana which is the first book. Thus ends the ninth chapter of the book of war of Valmiki Ramayana which is the first book. Thus ends the tenth chapter of the book of war of Valmiki Ramayana which is the first book. Then thousands of trumpets gave rise to huge sound and several conches produced tumultuous sounds. Thus ends the eleventh chapter of the book of war of Valmiki Ramayana which is the first book. 12.In the general council Khumbakarna speaks. Thus ends the twelfth chapter of the book of war of Valmiki Ramayana which is the first book. Thus ends the thirteenth chapter of the book of war of Valmiki Ramayana which is the first book. 14.Vibheeshana advices Ravana and other Rakshasa chiefs. Thus ends the fourteenth chapter of the book of war of Valmiki Ramayana which is the first book. Thus ends the fifteenth chapter of the book of war of Valmiki Ramayana which is the first book. 16 Ravana Talks harshly to Vibheeshana and he leaves him. Thus ends the sixteenth chapter of the book of war of Valmiki Ramayana which is the first book.